Ryan joined the Marine Corps after he graduated from high school in July of 2005. Everything he did for the next five years was for his country – he left his dreams at home, along with his longtime friend and current high school girlfriend, KaLeigh Kabatzke. It was almost four years since 9/11 – a day no American will forget, and a day that inspired Ryan’s call-to-service. In October 2008, Ryan deployed for a second tour in Iraq in support of Operation Iraqi Freedom (OIF) with Marine Wing Support Squadron 373. He was now a lance corporal three years in to his military service. Stationed in Al Taqaddum, an airbase located in central Iraq and approximately 50 miles west of Baghdad, Ryan and his platoon were primarily responsible for convoy and foot patrols in and around Al Habbaniyah, specifically providing overall security to the area of military operation and also working with the local nationals. It was supposed to be a routine night patrol, but when Ryan’s convoy rolled out at dusk on December 5, 2008, he quickly learned this particular night mission would be different than others. While traveling through a well-known intersection, Ryan’s mine resistant ambush protected (MRAP) vehicle struck a roadside pressure-plated improvised explosive device (IED), injuring Ryan, rendering the vehicle inoperable, and stranding the platoon until the explosive ordinance disposal team arrived. The signature weapon for OIF and Operation Enduring Freedom (OEF) was IEDs, accounting for the majority of wounded and killed military personnel in combat situations. The Department of Surgery, Orthopedic Surgery Service, and William Beaumont Army Medical Center conducted an analysis of wounding patterns in Iraq and Afghanistan from 2005 to 2009, which revealed explosive mechanisms (primarily IEDs) accounted for 23,793 injuries and for 74.4% of combat casualties. Data from the Defense Manpower Data Center show explosive devices caused 34,647 total U.S. casualties in the Global War on Terrorism from October 2001 to May 2012. It’s a feeling many combat warriors experience – because they all know what IEDs can do to a human body. IEDs are produced in varying sizes and have different types of containers, functions, and delivery methods. To increase bodily damage, their shells are typically packed with common hardware, which includes, but is not limited to: ball bearings, bolts, nuts, nails, chemicals and more. Luckily, the rest of Ryan’s team was not badly injured. Upon return to his duty station, medical staff treated Ryan for perforated ear drums and diagnosed him with a traumatic brain injury (TBI). Once Ryan regained his motor skills and was deemed coherent enough to return to duty, Ryan rejoined his team. But like many warriors returning from the battlefield, no one knew the full extent of his injuries because they were not visible. Due to advances in medical technology, many service members are surviving wounds associated with IEDs and other explosive weapon systems. These warriors live with the aftermath of their bravery for the rest of their lives. Ryan is no exception as he deals daily with his traumatic brain injury, coupled with other bodily injuries and post-traumatic stress disorder. There are too few ways to pay respect for the sacrifices service members make on the battlefield, and it is not uncommon for extraordinary acts of valor like his to go unrecognized. Since his second deployment, Ryan has fought for his health benefits with the Department of Veterans Affairs (VA). In 2014, Ryan sought help from the Wounded Warrior Project® (WWP) Benefits Service team to file benefits claims for injuries sustained while serving active duty. After researching Ryan’s military background, WWP began creating a case for a formal request, asking the Department of Defense (DoD) to honor Ryan’s sacrifice with the award given to those warriors who have been killed or injured in combat – the Purple Heart. 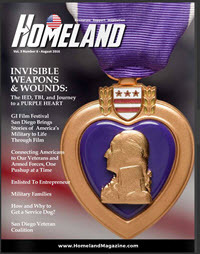 On March 25, 2016, the DoD presented Ryan with the Purple Heart for outstanding achievement in the performance of his duties in support of Operation Iraqi Freedom. The DoD praised Ryan for ensuring the security and safety of his vehicle and the rest of his team when his vehicle came into contact with an IED; his actions were in keeping with the highest traditions of the United States Marine Corps. “The TBI impacts my life every day and will for the rest of my life,” said Ryan, who has slowly begun to put his life back together. “I have a hard time remembering things, like why I came into a certain room of the house, what I had for breakfast, and where I parked my car. I get headaches and have a strong sensitivity to light. My life is very different now than what it was before my injuries, but I am learning to cope. I have to set up reminders on my phone. I wear sunglasses all the time. And I rely on a lot of assistance from my wife,” said Ryan, who finally married his high school sweetheart, KaLeigh, in September of 2011. Ryan is now enrolled in a WWP program that focuses on long-term independence for warriors, helping them to live life to the fullest, on their own terms. Through gracious donations, WWP is able to provide Ryan and warriors like him with support and training for involvement in meaningful social and recreational activities that focus on wellness, volunteer work, education, and other life skills. To the warrior, it’s just a job. Still, the monumental sacrifices made by veterans leave many in awe and deserve the recognition they earned on the battlefield.